Our Anhydrous Sodium Acetate is highly appreciated in the national and international markets. We stand among the major Industrial Anhydrous Sodium Acetate Suppliers based in India. Our Pharmaceutical Anhydrous Sodium Acetate is available at very affordable prices, suiting the budget of all. Sodium acetate is available as a white odourless powder. 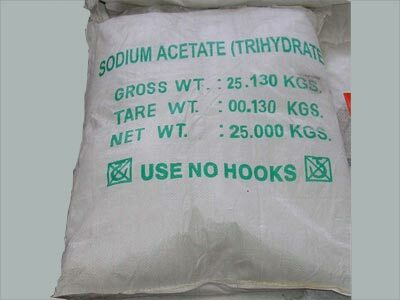 Sodium Acetate is supplied in poly lined Poly Ethylene bags of 50 kgs each and stuffed lose in a container of 21 MT capacity. Sodium Acetate is hygroscopic. It should be stored and handled in its original packages or in suitable Sealed containers and kept in a clean dry place. Under normal conditions of use Sodium Acetate acetate does not present any undue health hazard. Precautions should be taken to prevent entry into the eyes and prolonged or repeated skin contact. Exposure to the dust at high concentrations should be prevented by the provision of suitable ventilation. In the event of eye/skin contact occurring, immediately imigate with copious quantities of clean water, holding the eye open if necessary. Obtain medical attention. Sodium Acetate is used for the manufacture of Dye and colour intermediates, pharmaceuticals, cinnamic acid, soaps, photography, purification of glucose. It is also used in meat preservation, medicine, electroplating tanning, dehydrating agent, buffer, lab reagent, and food additive.